Our previous welcome offers were a 100% matched slots deposit up to $787 and for non-slot players 100% up to $150. 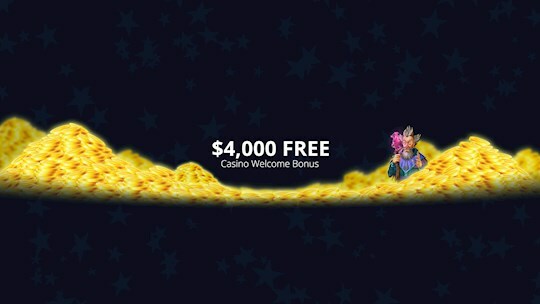 Our new welcome offers are much more generous and gives those who deposit on our slot, keno and scratch card games a 400% deposit bonus up to a maximum of $4,000. Alternatively we offer a 100% welcome bonus up to a maximum $1,000 deposit. See the individual terms and conditions for the finer details. Only one welcome offer per person please, and it’s only available on your first deposit. The coupon must be redeemed in the cashier before you make a deposit and if both welcome offer codes are used all bonuses and winnings will be void, so only use one offer coupon guys! Be sure to check our online casino bonus policy and FAQs for further details. Besides our generous welcome offers we have a range of great offers every day. On a Monday you can receive a 60% deposit bonus times 2 as well as 25 free spins on RTG’s Achilles slot game. The Tuesday offer gets you a 65% free deposit bonus times 4 and a free $20 after your fourth deposit. For Wednesday we give you a 70% free unlimited slots bonus and on Thursday a 65% free deposit bonus times 3 and 25% cashback on net losses. We celebrate Friday with a 75% free triple use slot bonus and for the weekend we give you a 70% free slots bonus time 5 for deposits over $100 and 65% for deposits under $100. Check out online casino promotions page for more details or follow us on Twitter and Facebook for instant updates.